Too often we’re left with mountains of little balls of sock yarn. Here’s a nice and easy way to use up those leftovers bits. 1. If you have two colors you want to use up, use one color for the cuff, heel flap, and toe. colors every few rows. 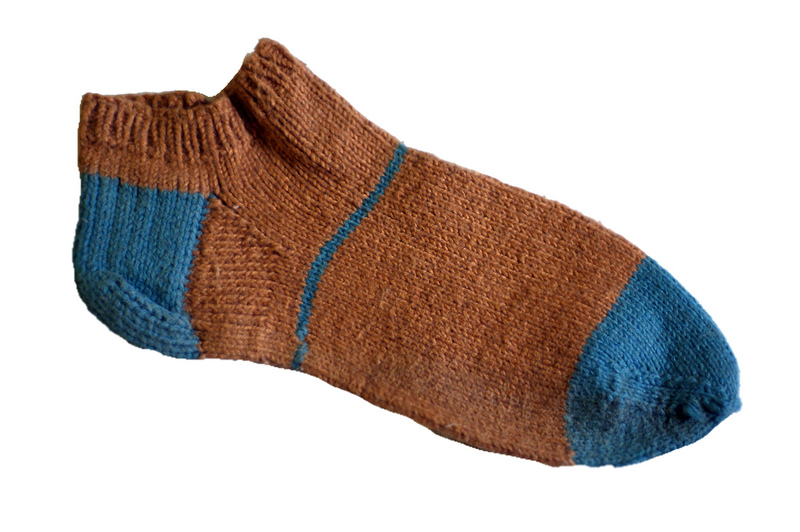 Just makes sure you use the same striping pattern for both socks. 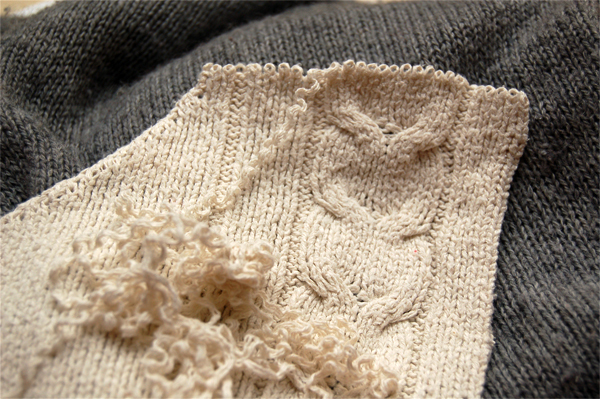 Cast On(MC): 52(56, 60, 64, 68), 13 (14, 15, 16, 17) sts on each needle. Rnd 1: K1, sl 1 across 26 (28, 30, 32, 34) sts, turn. Rnd 2: P1, sl 1 across 26 (28, 30, 32, 34) sts, turn. Place unworked sts on a stitch holder. Rnd 1: K across 13(15, 16, 17, 18) sts. SSK, K1, turn work. Rnd 2: Sl 1 purlwise, p5, p2tog, p1, turn. Rnd 3: Sl 1 purlwise, k to 1st stitch before gap (1 st from each side of gap), SSk, k1, turn. Rnd 4: Sl 1 purlwise, p to 1st stitch before gap, p2tog, p1, turn. enough sts to p2tog, p1. There will be 16(16, 18, 18, 20) sts remaining. Needle 4: k 8(8, 9, 9, 10) and pick up and k 13(14, 15, 16, 17) sts with needle 4. Rnd 2: K to last 3 sts on needle 1, k2tog, k1, K all on needles 2 & 3, K1, SSK, K to end. Repeat rnds 1 & 2 until there are 52(56, 60, 64, 68)sts remaining. your back of heel to base of big toe. Rnd 1: Needle 1, k to last 3 sts, K2tog, K1; needle 2: K1, ssk, k to last 3 sts on needle 3, k2tog, k1. Needle 4: k1, ssk, k to end. Repeat rnds 1 & 2 until 24(28, 28, 32, 36) sts remain, ending with a k all rnd. Turn sock inside out and 3 needle bind off to seam up remaining sts. Weave in all ends. Make another one to have a pair. Note: If you would like to make longer socks, just work the 2×2 ribbing for desired length. It’s been a lot of fun posting about using up your leftover yarn. 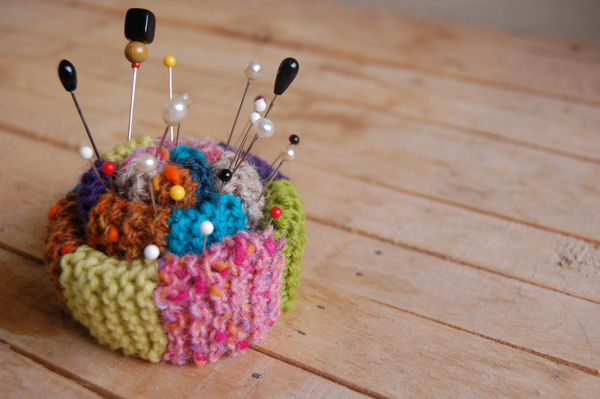 Creative ways to rethink, organize, and fall in love with your scraps. Here’s a round up of the posts I’ve done over the past couple of weeks. It’s been a really great experience for me and I think it will actually help to improve my own blogging on Craft Leftovers – editorial standards, copy editing, consistency, and all that sort of thing. Even just things like having banners for my different type of posts: ReDress, Thrift Kitchen, book reviews, Patterns, HowTo’s. I hope over the next month I’ll be able to start acting on the things I’ve learned from the staff at CRAFT, they are one amazing group of people. I love their website and they are constantly promoting and giving opportunities to the fresh starts out there, like myself! They have really helped Craft Leftovers hit the ground running. Thanks CRAFT team!